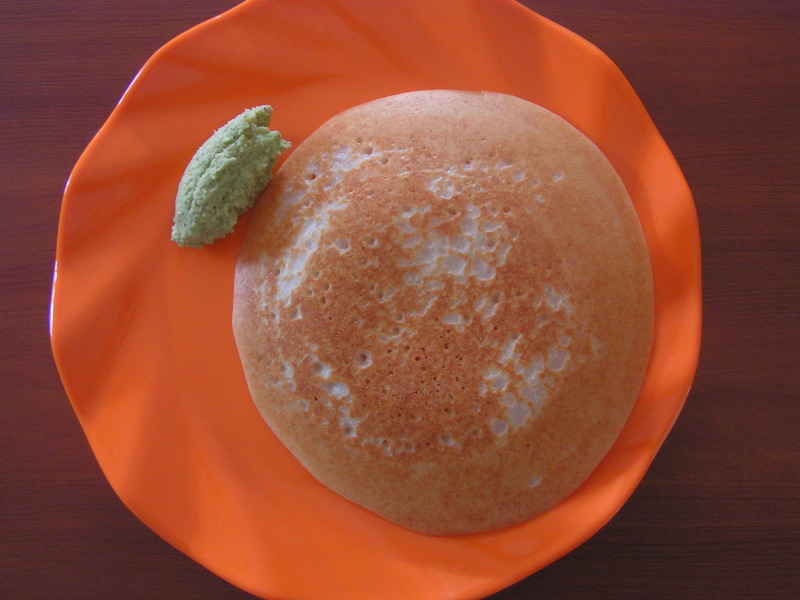 Appam is a healthy recipe from kerala and most popular among Kerala breakfast recipes that are healthy and easy to make. These white pan cakes have a crispy side, soft to touch and fluffy in the center. 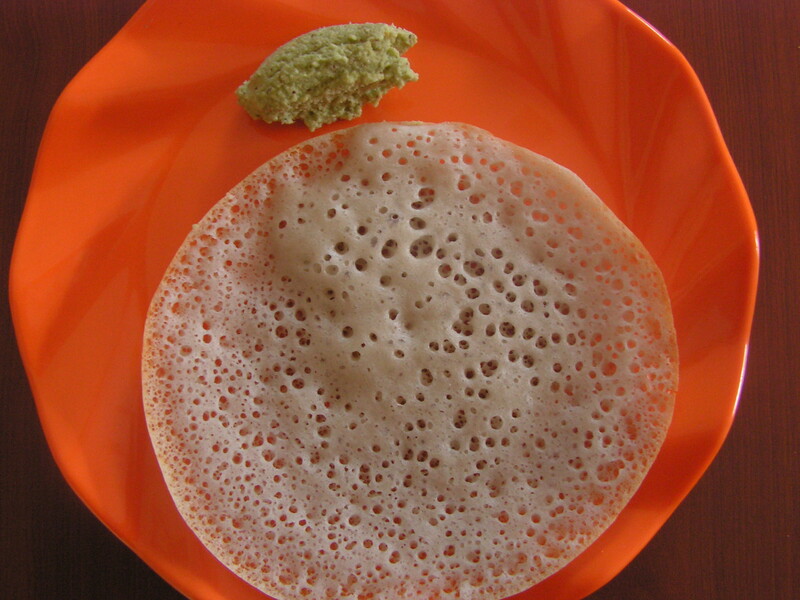 Appam recipe has minimal ingredients and is usually served with vegetable stew, veg-kurma or even coconut chutney for sure!!! 1. 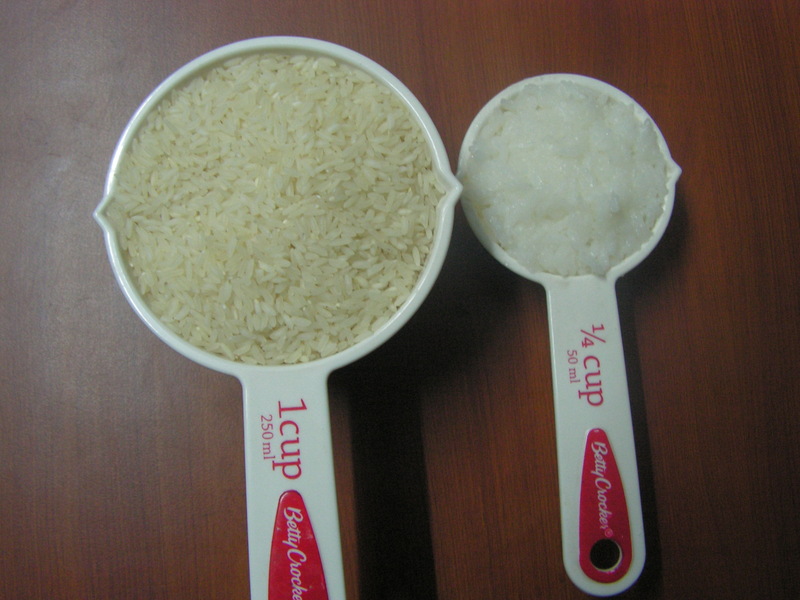 Soak raw rice in water for about 2-3 hours. Drain water and keep it aside. 2. 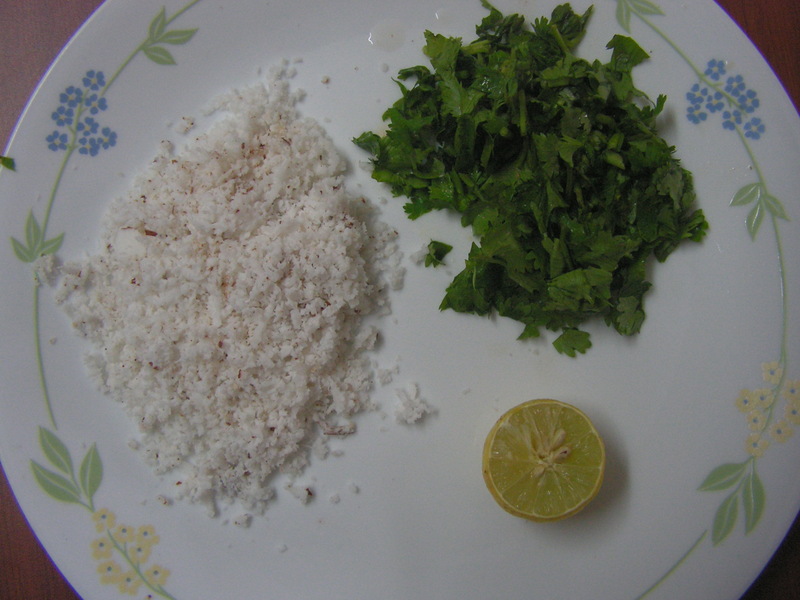 Grind 3/4 cup of grated coconut in the mixer adding water in steps to little less than fine consistency and strain it through a sieve/linen cloth and extract coconut milk. 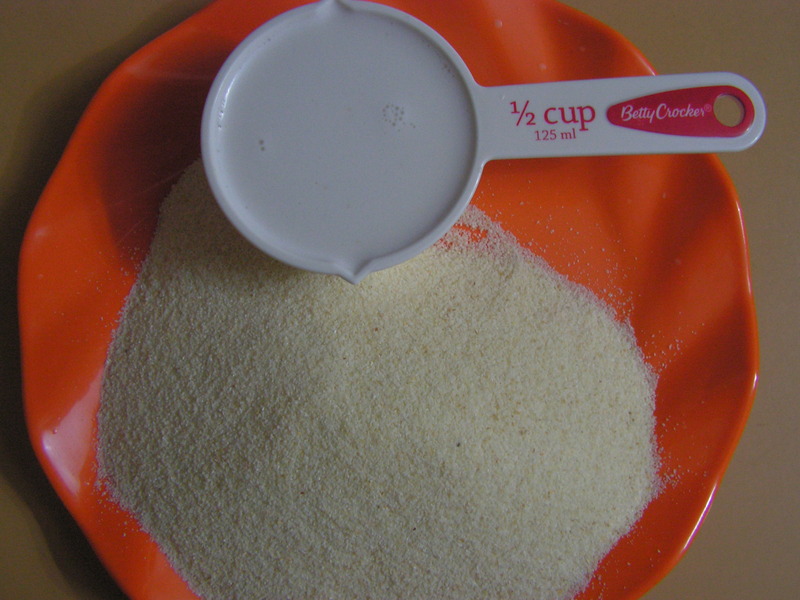 Just dissolve yeast in warm water and till it comes up you may grind soaked rice with coconut milk to a medium fine consistency. 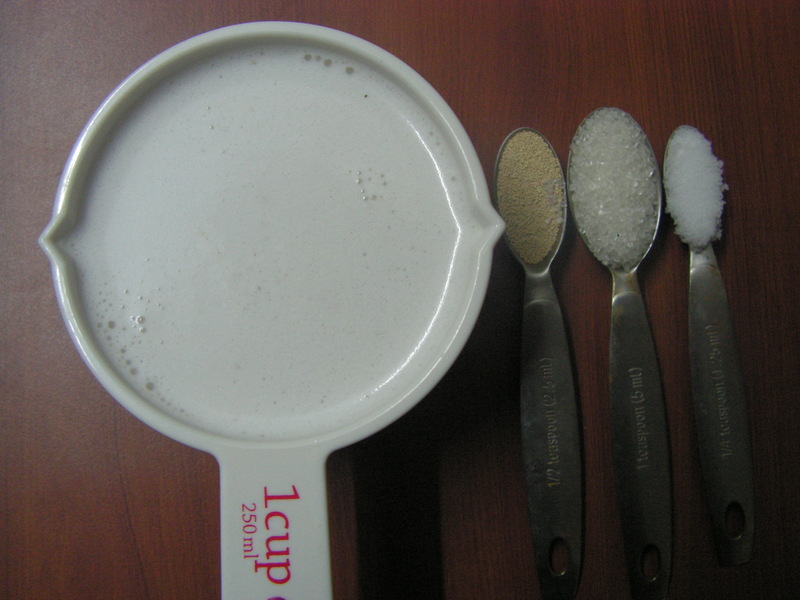 Add salt, sugar and dissolved yeast to it and allow it to ferment over night. 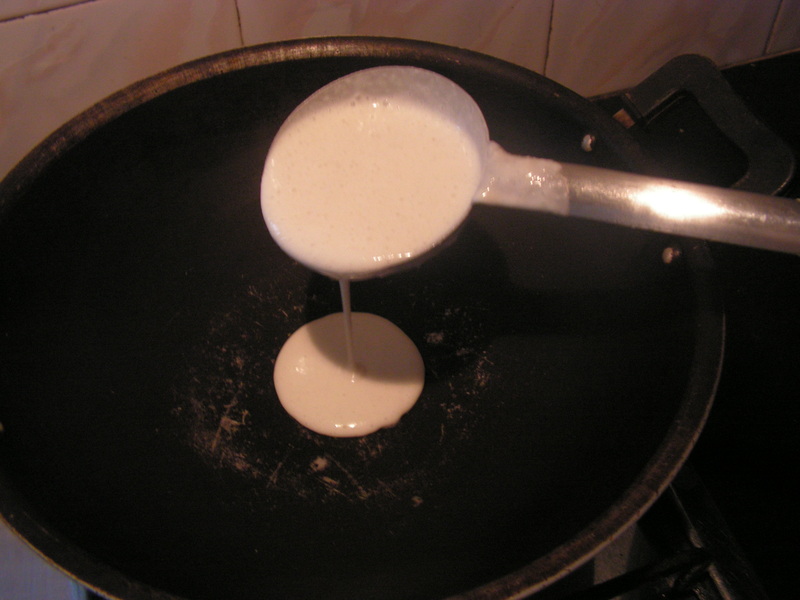 Check the batter before you make appam. 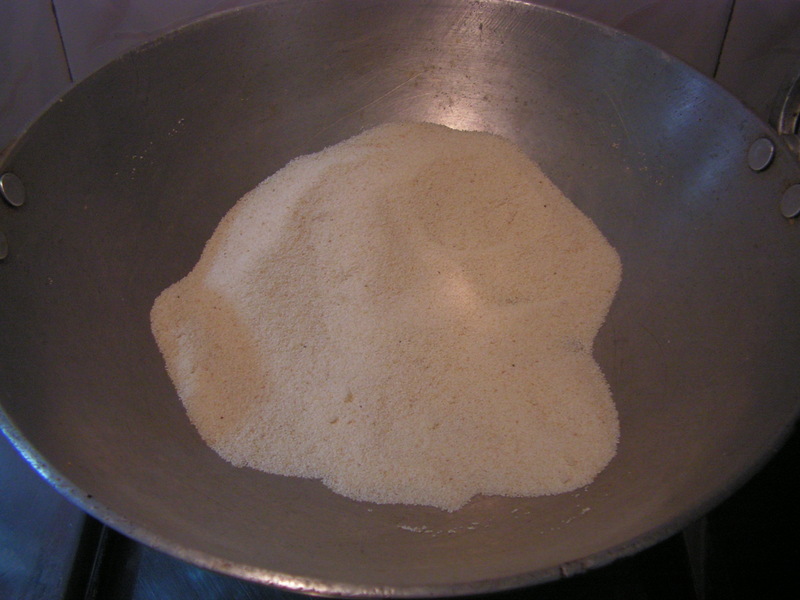 Let the batter be to the falling consistency. 3. 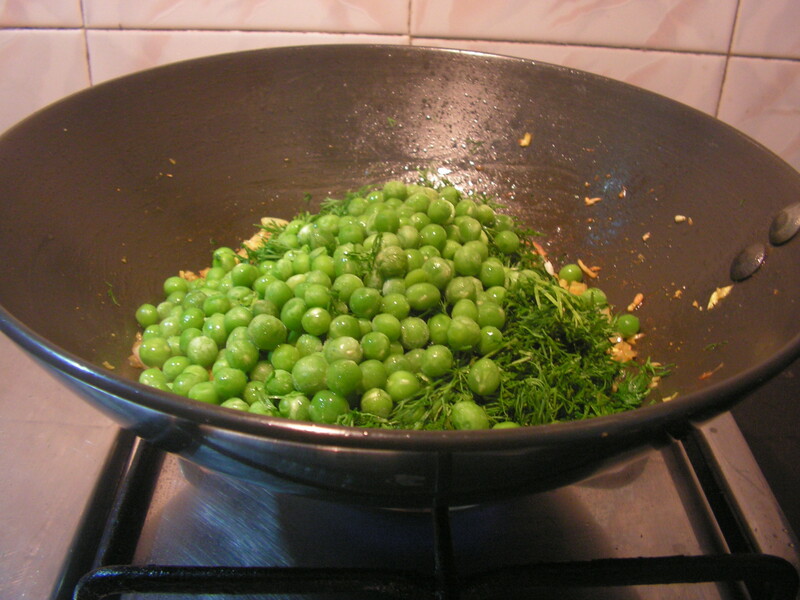 Place a skillet/non stick on low/medium flame. 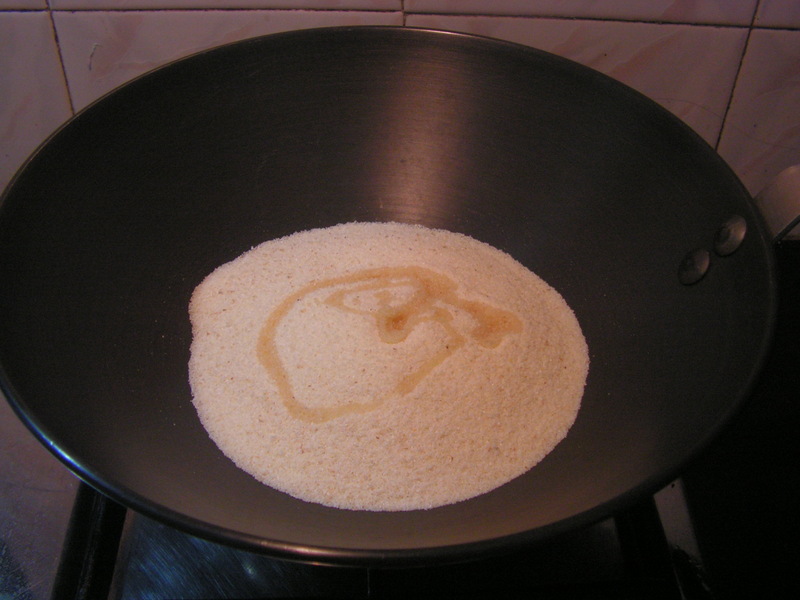 Just pour a laddle of the batter and swirl the skillet as shown in the image for the batter to spread in round fashion. Do not spread it with the laddle. 4. 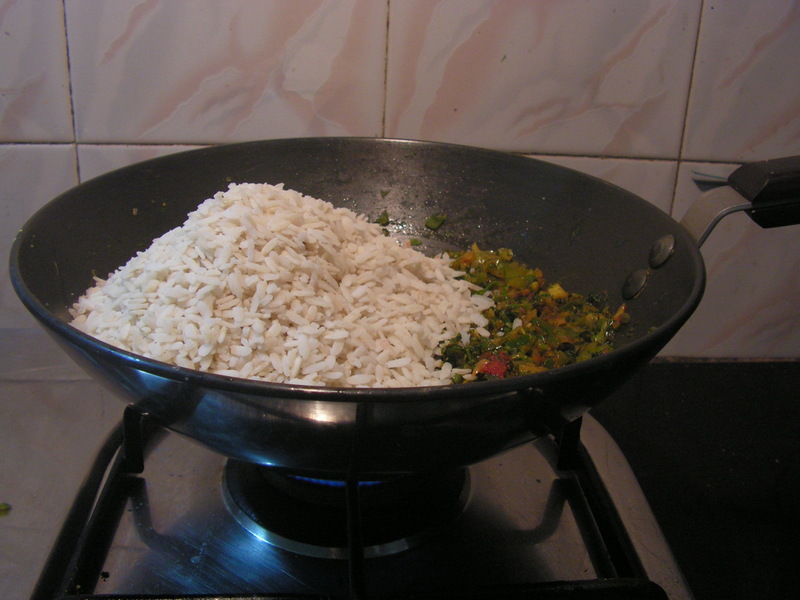 Close it with a lid and cook till the sides are crispy and the dish cooked right with holes through out and cooked right. 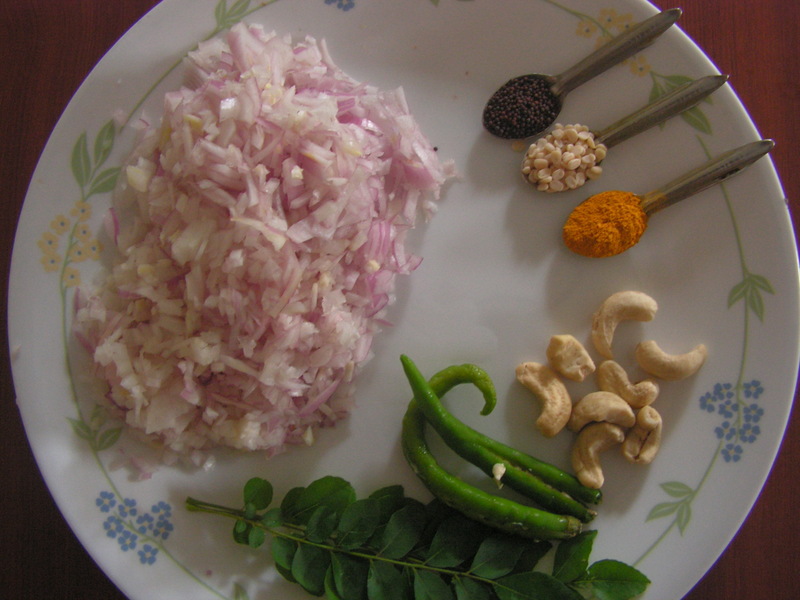 Just rub it with a dry coconut coir and no oil/ghee!!! 5. 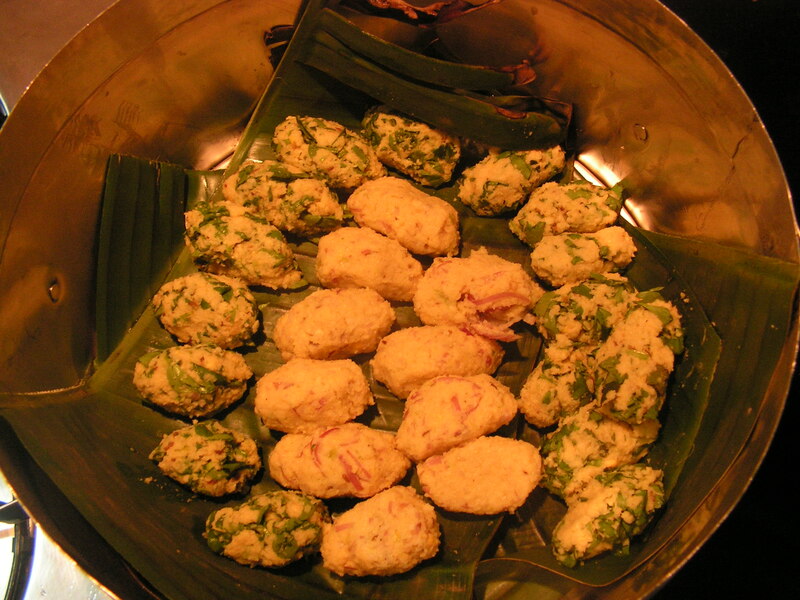 Transfer it to a serving dish and enjoy with any side dish or even coconut chutney!!! Note: 1. 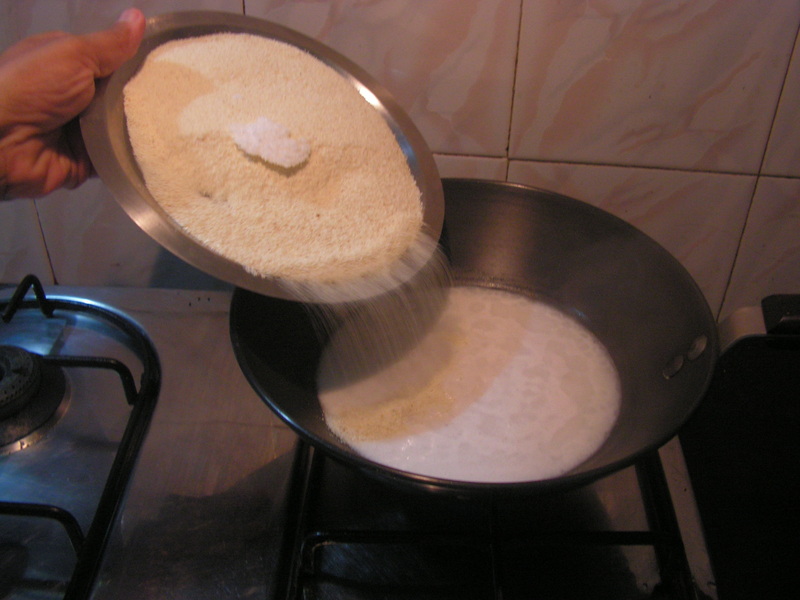 Soaked rice should be grind with coconut milk (home made) or even store bought. 2. 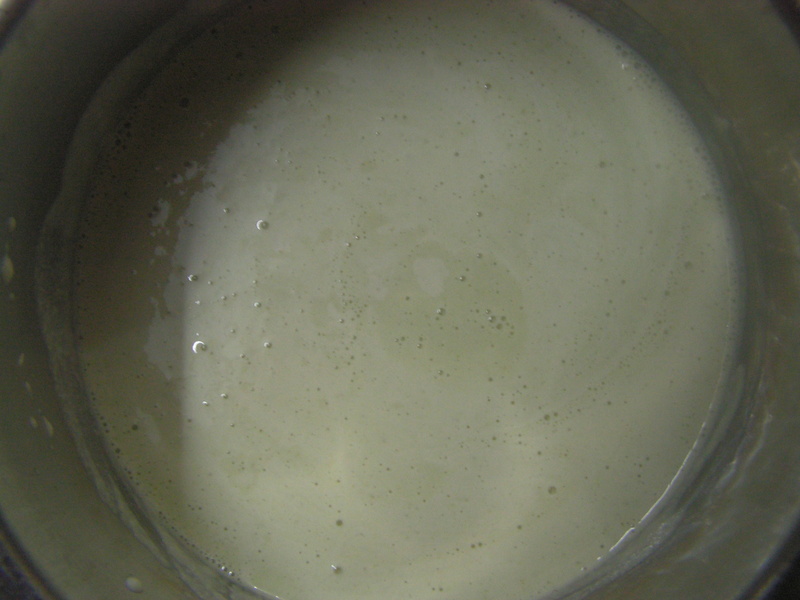 Yeast helps the batter to come up and also to ferment well. 5. No need to even brush or splash oil/ghee. 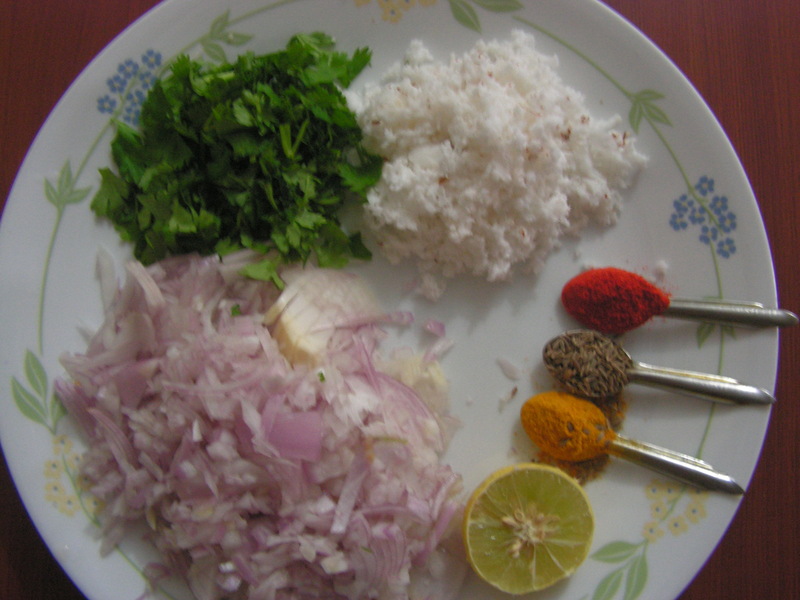 This entry was posted in Uncategorized and tagged Breakfast, Kerala dishes. 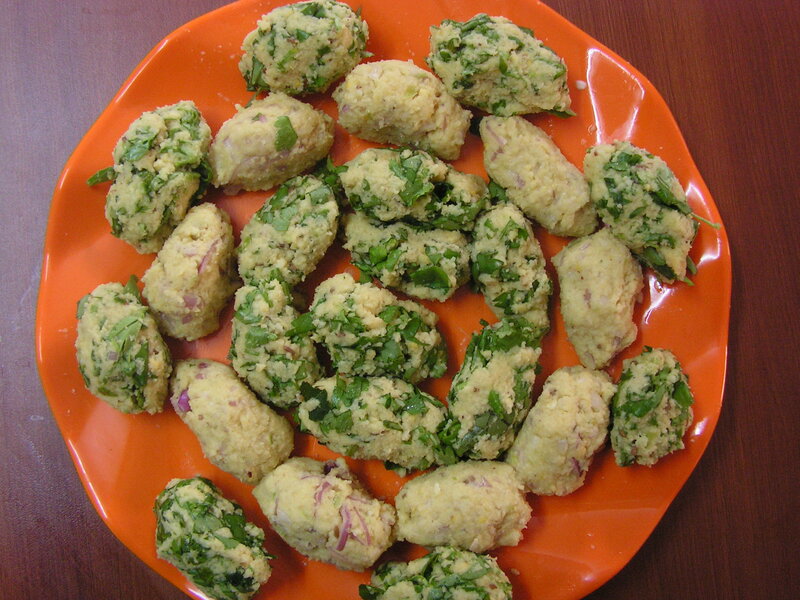 Sujee is available in various varieties like the Bombay sujee (upma sujee), Kesari sujee (wheat sujee – used to prepare upma) and Chiroti sujee (used in Chiroti). 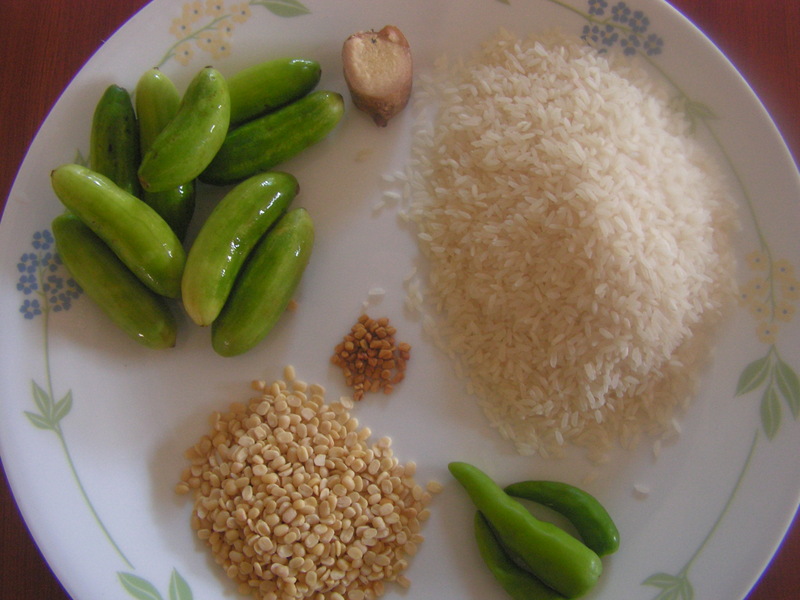 I used the Bombay Sujee, light on the stomach and healthier among various Sujee. 1. 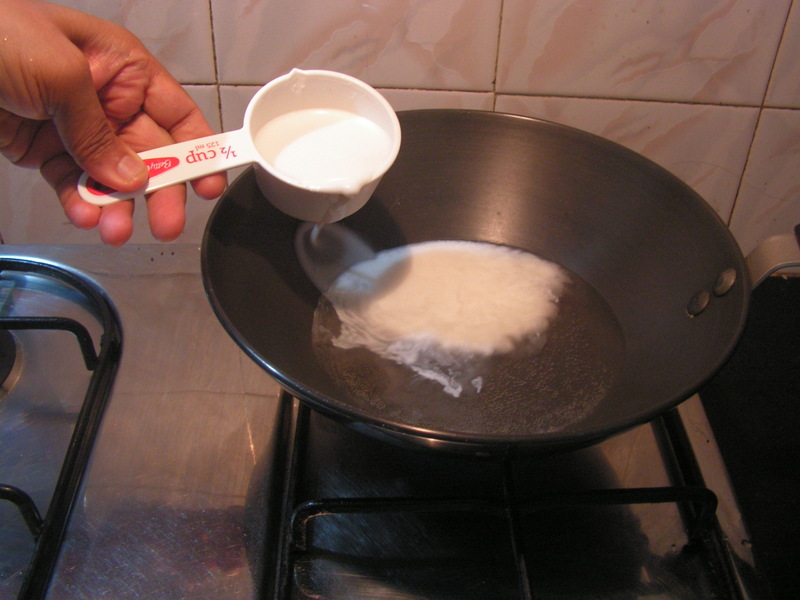 Place a wide pan with sujee in it on medium flame. 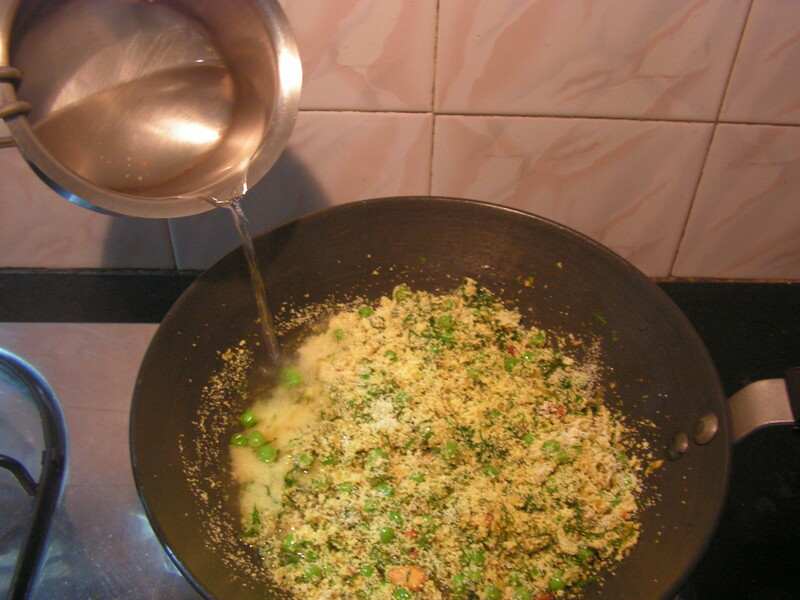 Add a teaspoonful of cooking oil and roast it till you get a pleasant aroma as you fry while preparing upma. Make sure it is roasted but not burnt !!! 2. 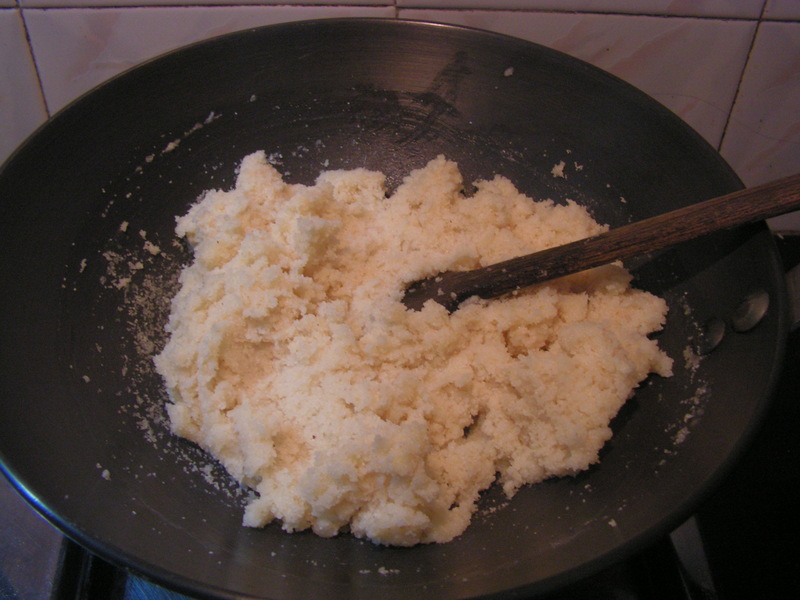 Grind 4 tablespoons of fresh coconut in the mixer adding a little water to a fine consistency. 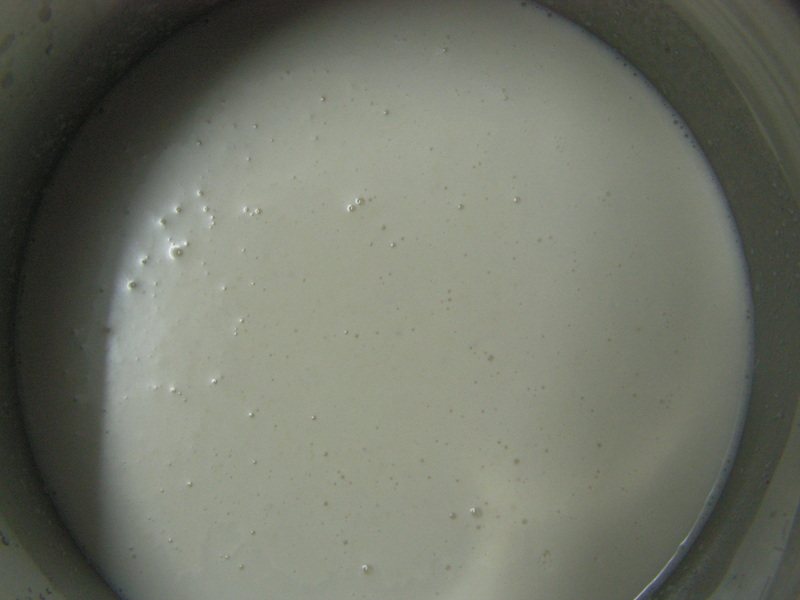 Strain it and extract coconut milk and keep it aside. 3. 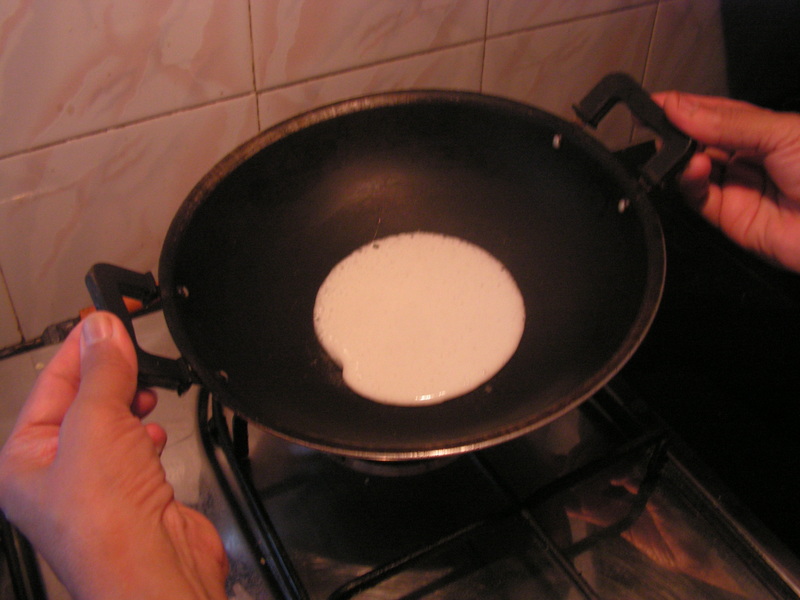 Place a wide pan with 1 cup water in it on medium flame. When it is about to boil add coconut milk to it simmering the flame. 4. 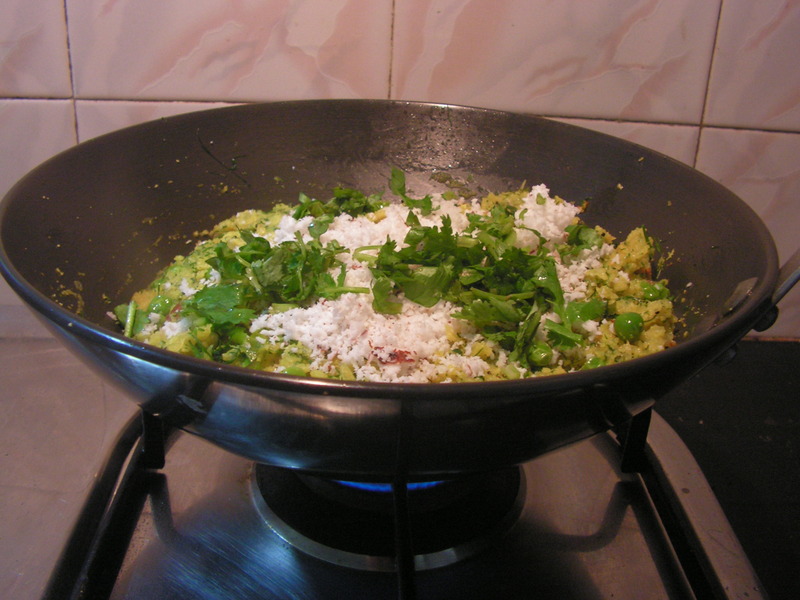 Add roasted sujee with salt to the boiling water-coconut milk mix simmering the flame. 5. Stir it continuously till it thickens. 6. Just dip your hands in water and make either round or elongated balls as convenient for you. 7. Place a wide bowl with water in it. 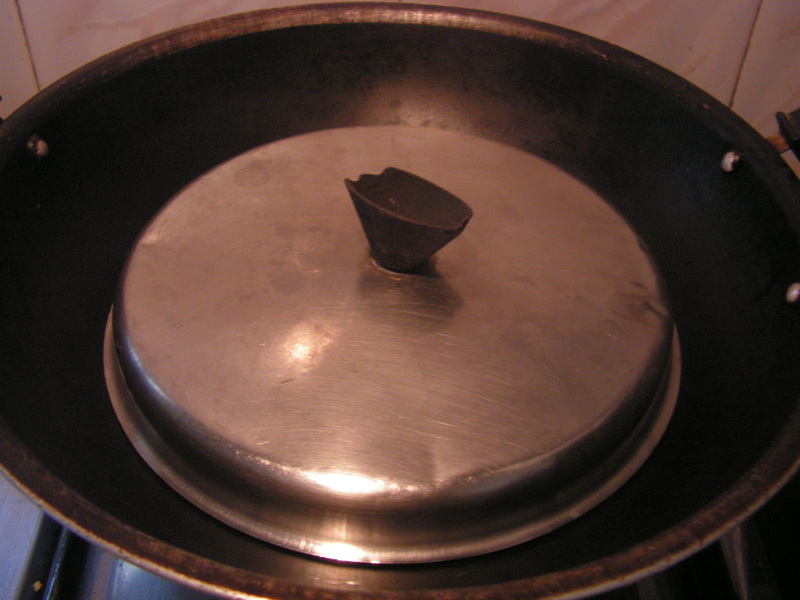 Once it boils place these balls in it and let it cook for just 5 minutes closing the lid. Insert a knife and if it comes out clean it means it is done. 8. 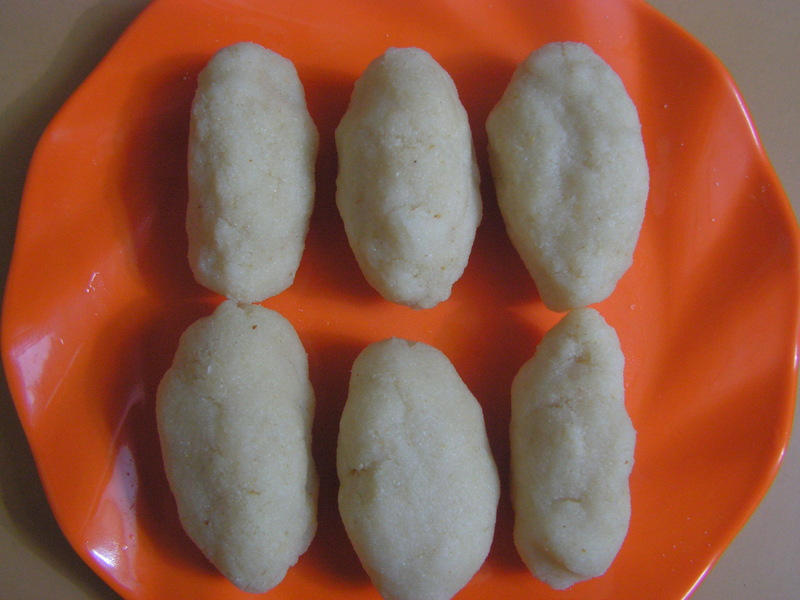 Place each ball in the semiya mould and press it. Yummy semiya is ready. 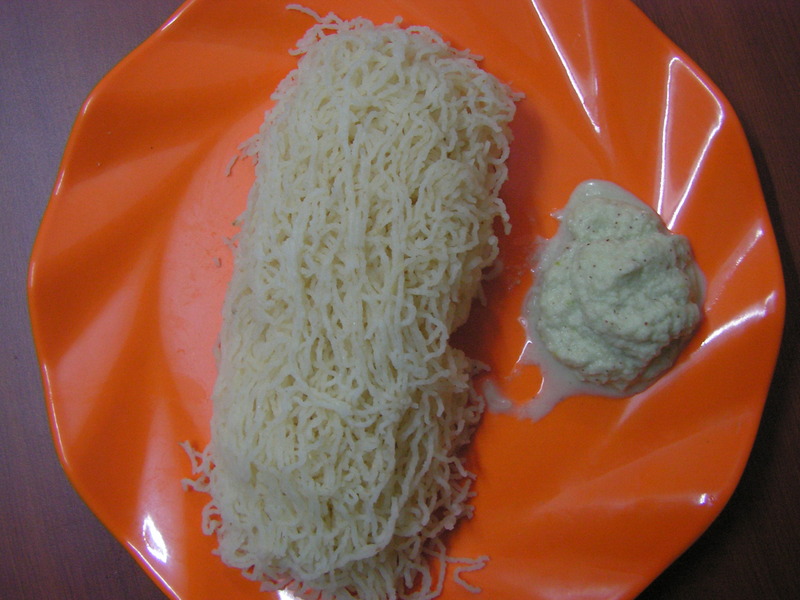 Let it cool and enjoy with any chutney of your choice. 1. 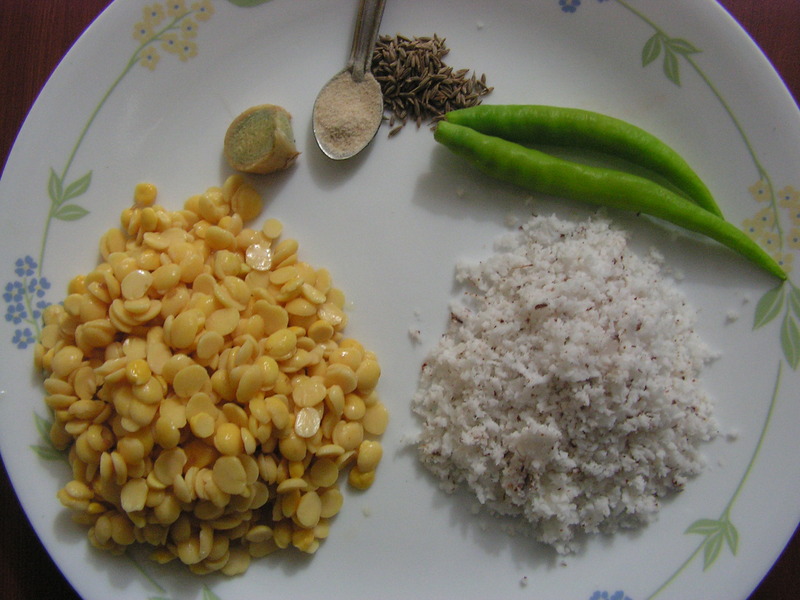 Sujee should be roasted till you get a pleasant aroma on medium/low flame depending upon your size of the burner. 3. While pressing the semiya the string should not break and it should be continuous. 4. For convenience one can even roast at leisure and keep so that it is easier to prepare the dish instantly. 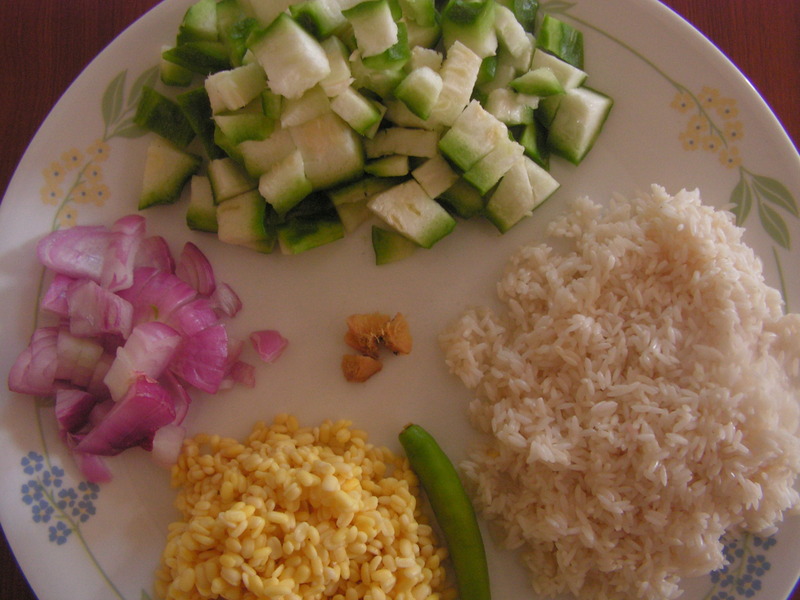 This entry was posted in Uncategorized and tagged Breakfast, Lunch box, Tiffin. 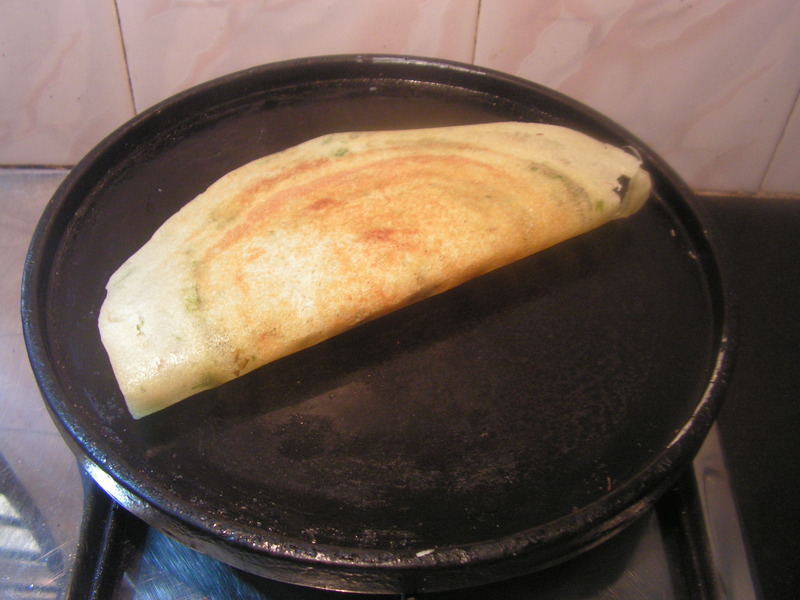 I just thought of giving a try to this unique dosa while I got fresh tinduras from my garden (!) couple of weeks ago. 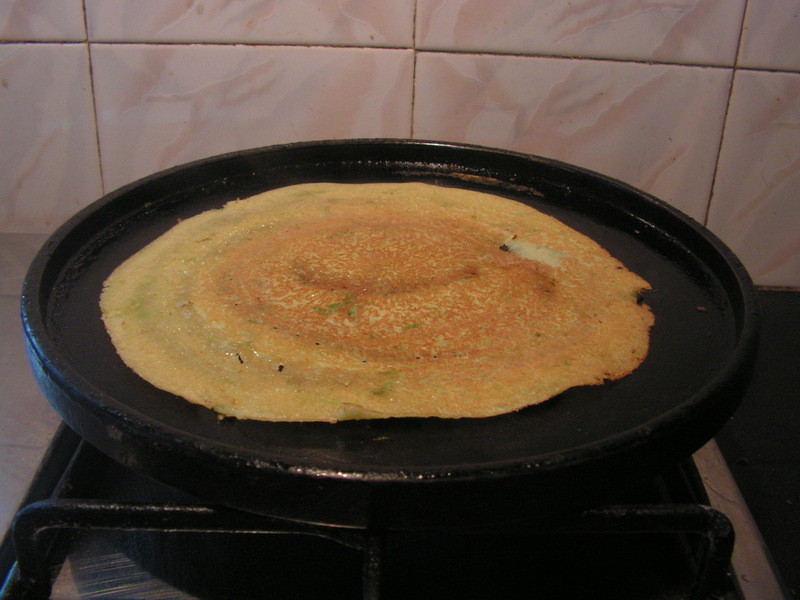 The Dosas came out great just like the crispy okra dosas which I put up a while ago. 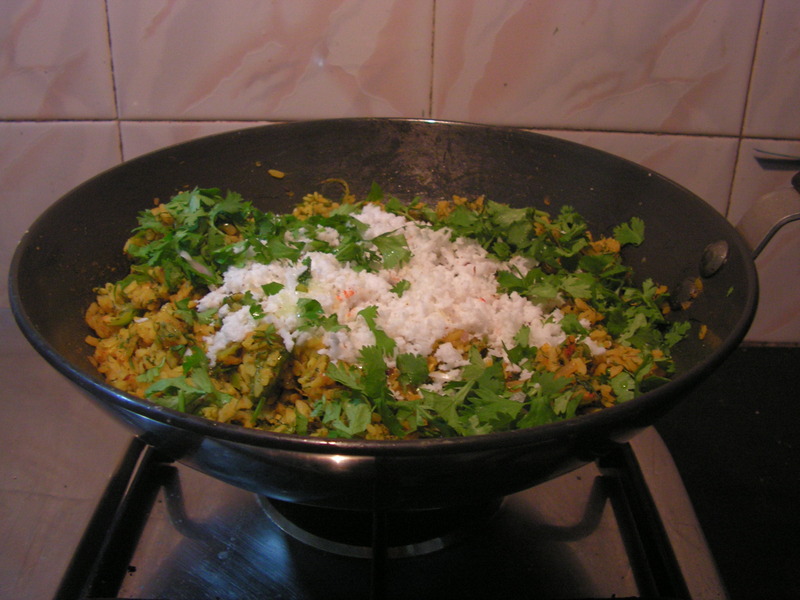 The ginger, green chilli and fenugreek and the coriander leaves leave nothing to be desired. 1. 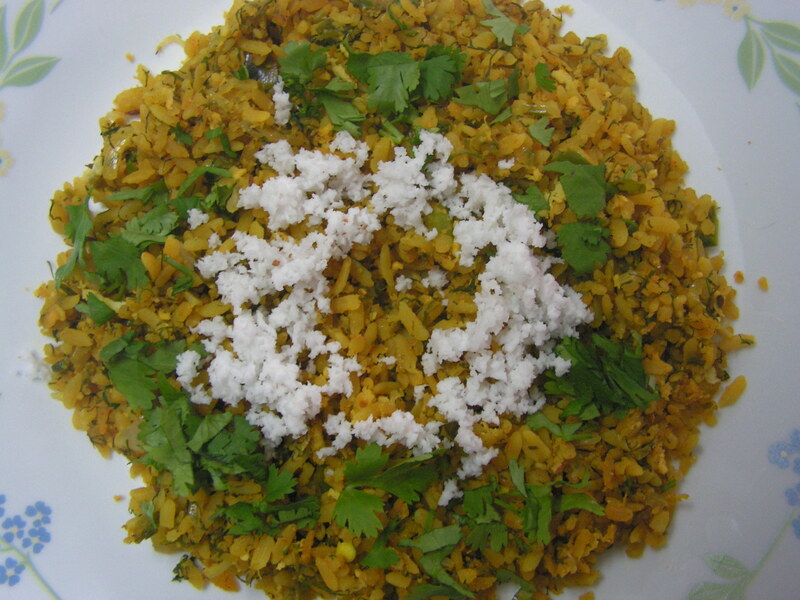 Soak rice, blackgram dal, fenugreek seeds, chopped tinduras in water for about 4 hours. 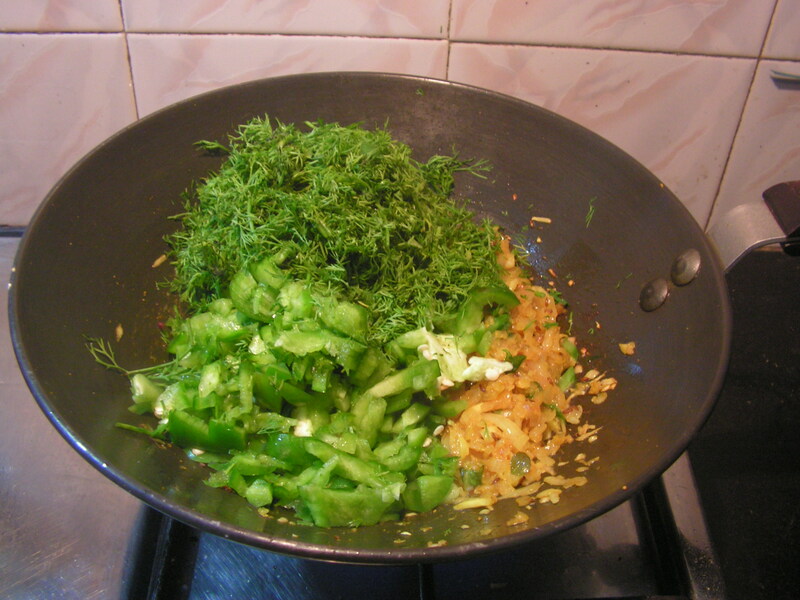 Drain it and grind it along with green chili, ginger adding water in steps to a fine consistency. Allow it to ferment overnight as usual. 2. 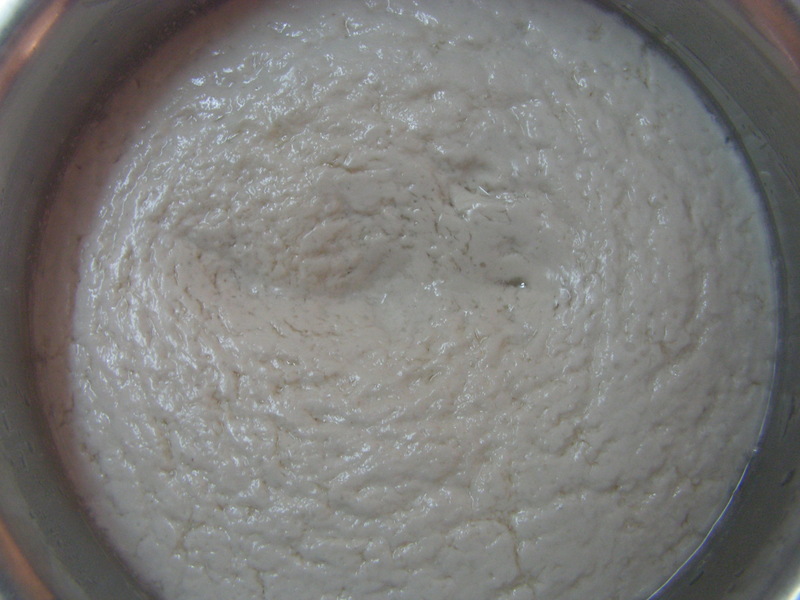 On fermenting the dough would be as shown in the image below. 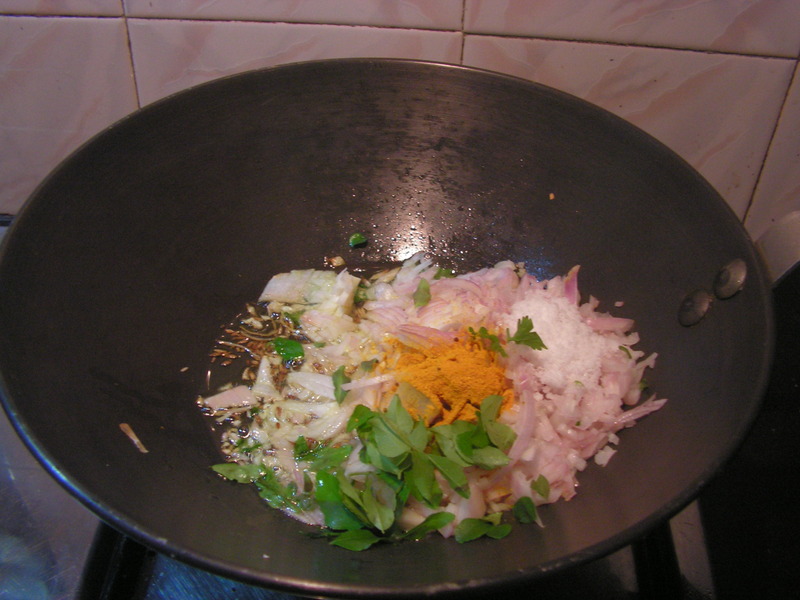 Add chopped cilantro and 1 teaspoon of cumin seeds to it. 3. 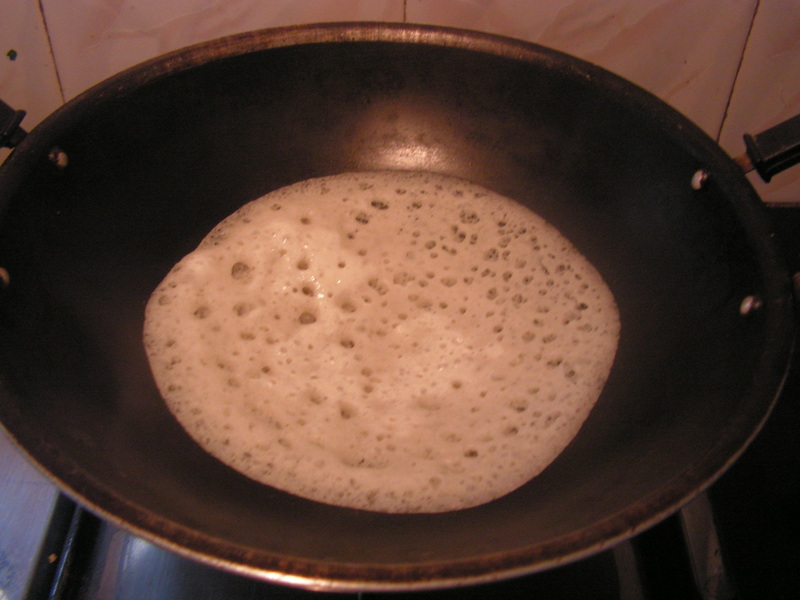 Place a dosa skillet on medium flame and splash a little cooking oil on it. Rub it with a coconut coir and splash a little water over it. 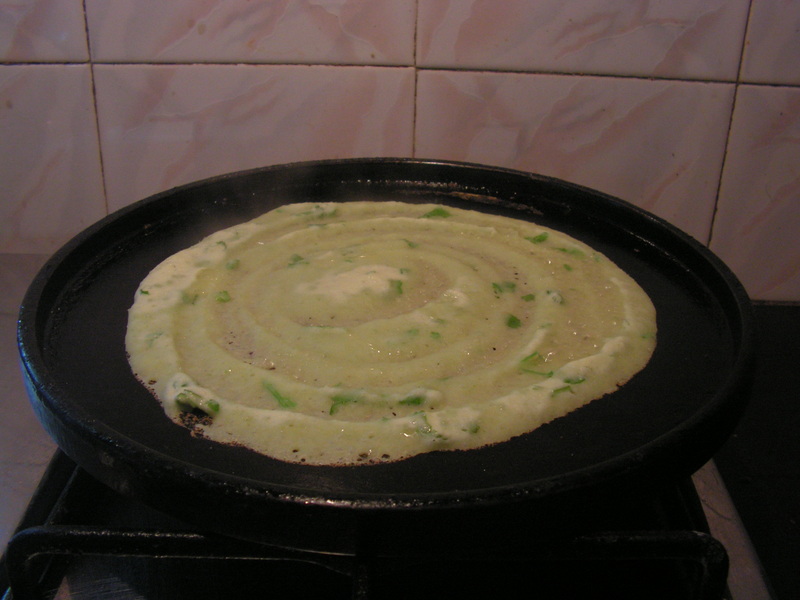 Spread a laddle of batter in a circular motion to required thickness and splash a little oil on the corners and in the middle of the dosa. 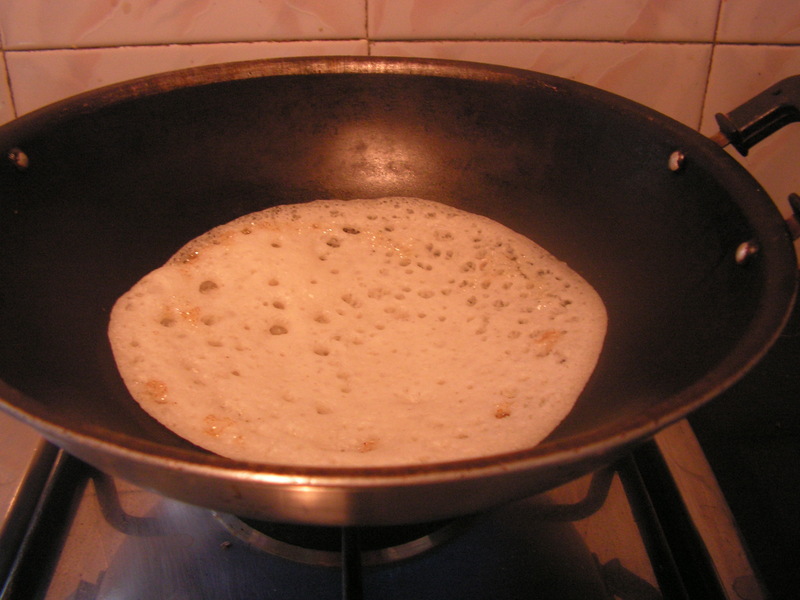 Cook it till dosa turns crispy. Just fold it and no need to cook on the reverse. 1. 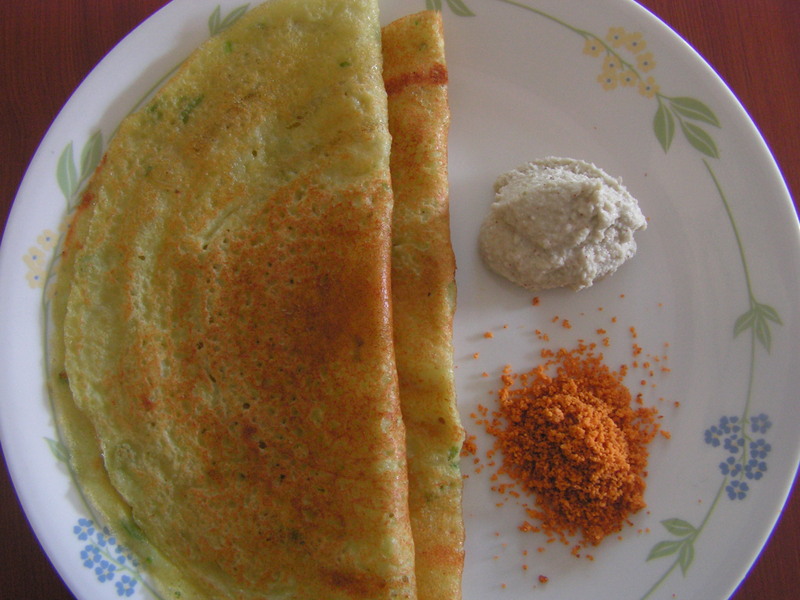 Grind the ingredients to a fine consistency to get crispy dosas. 2. Add enough water while grinding for better results. 3. 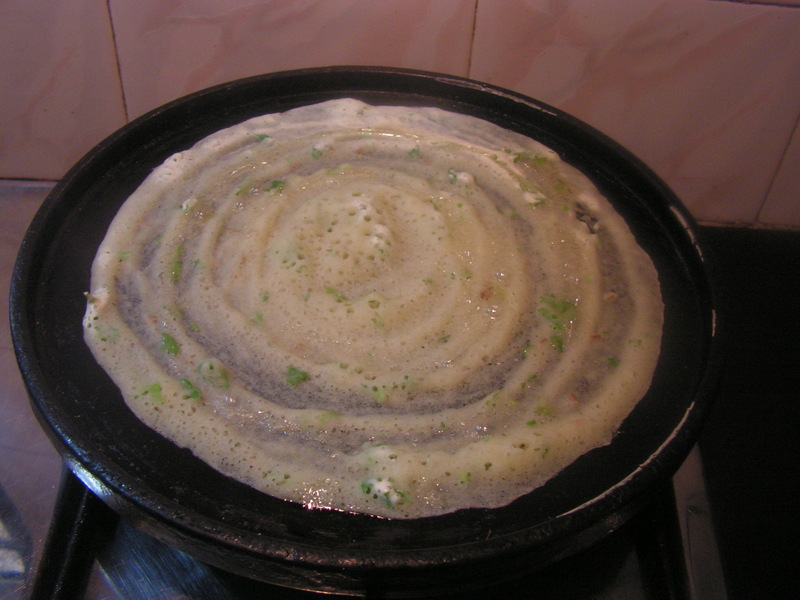 If the batter has not fermented make dosas only on fermenting. 4. 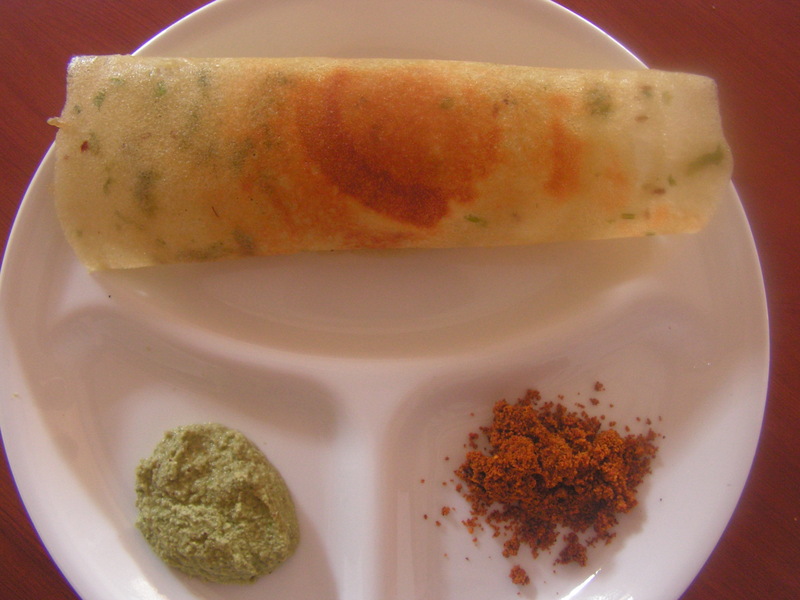 No need to flip dosa at all as dosa turns crispy at once. 1. 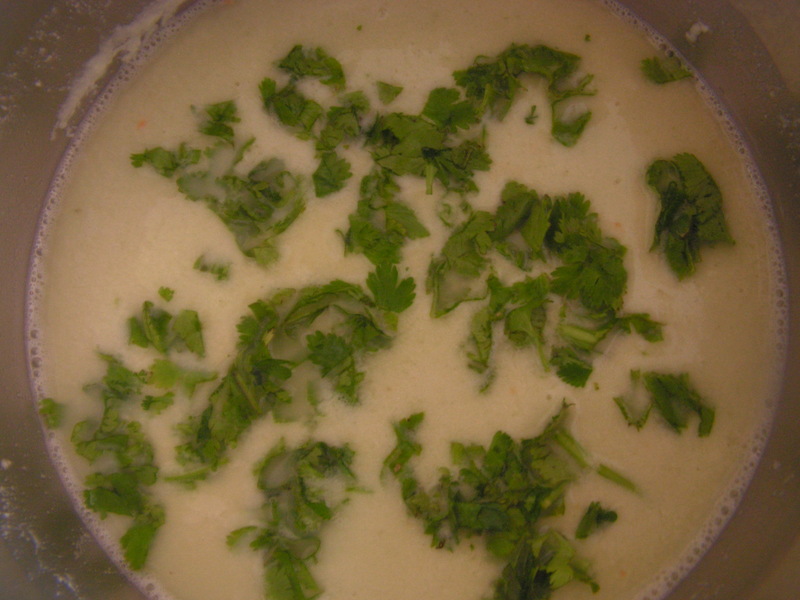 Soak both toor dal and Bengalgram dal in water together for about 4 hours and drain it out in a collander and keep aside. 2. 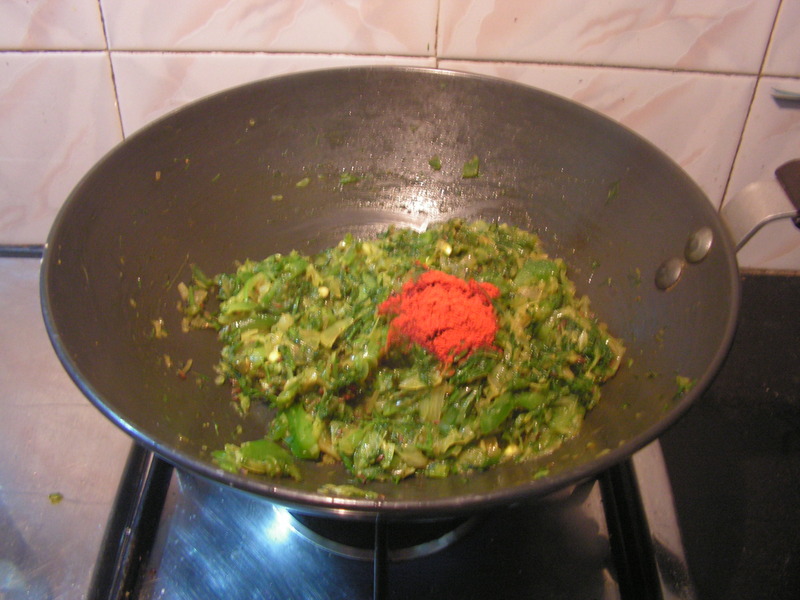 Grind it along with ginger, green chili, coconut, cumin and required quantity of salt to a medium coarse consistency. 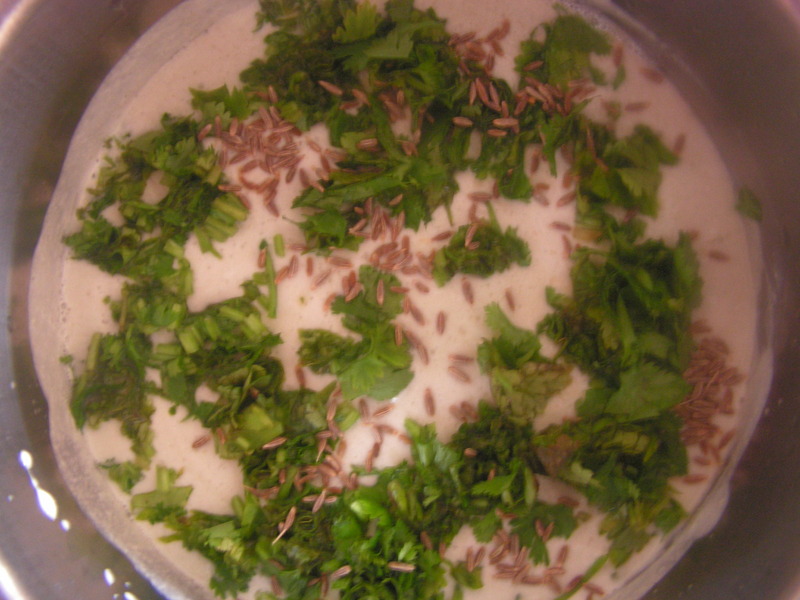 Add 2 tablespoons of cilantro to the grind dal and keep it aside. 3. 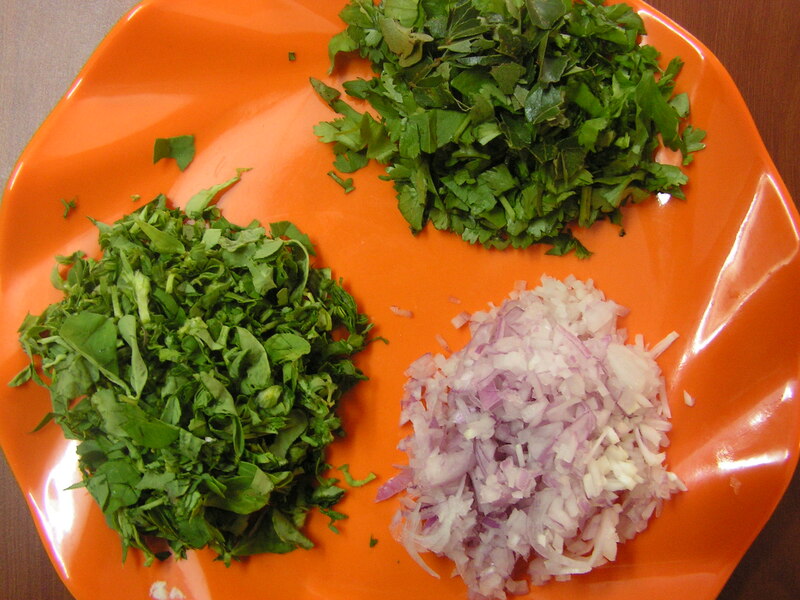 Divide the dough into 3 equal parts and add chopped onions to a part of it, and chopped methi leaves to another part of it and add chopped onions to the part of it and shape it into either round or oval shaped balls.The outer most round of dumplings being cilantro & curry leaves, the middle being onion mix and the inner most is the methi leaves mixed dumplings. 4. 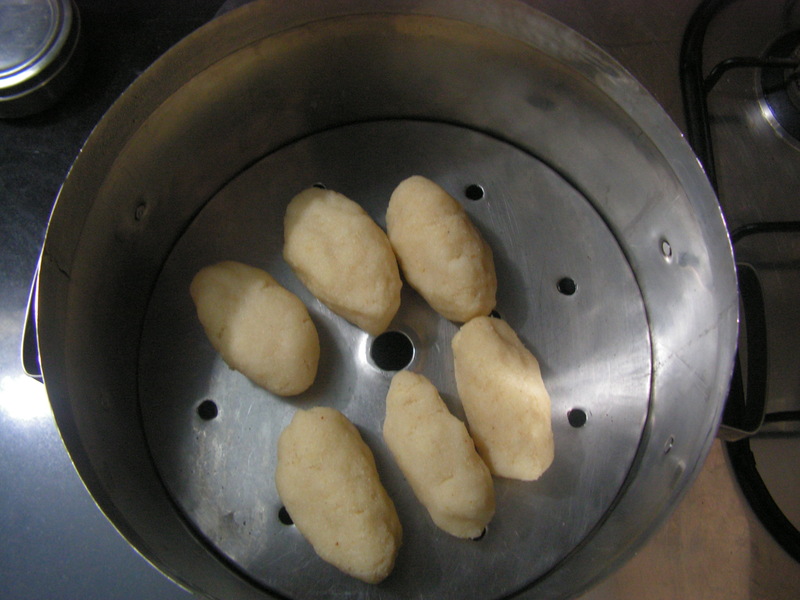 Steam these dumplings in the idli steamer or the cooker as you steam idli with out placing the weight of the cooker. Close the lid and steam it for about 25 minutes or till done. 5. 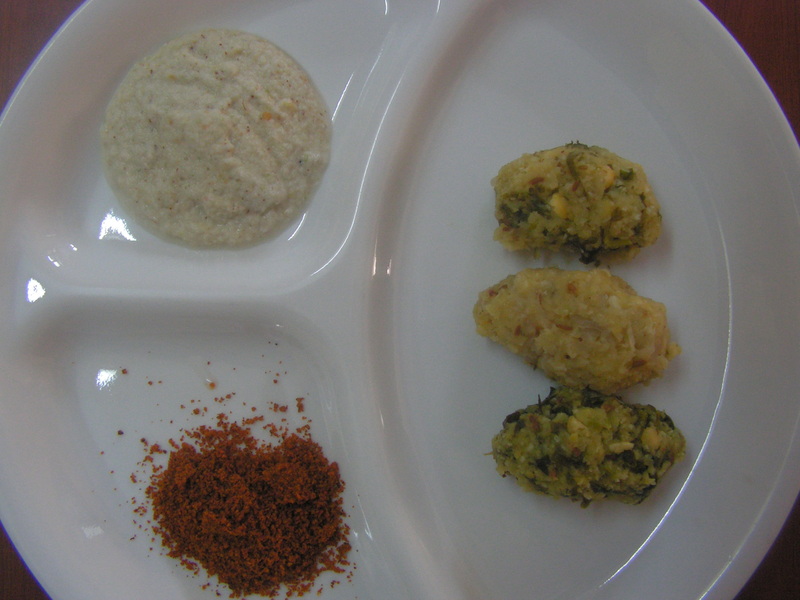 Enjoy with either Majjige huli or with coconut chutney of your choice. 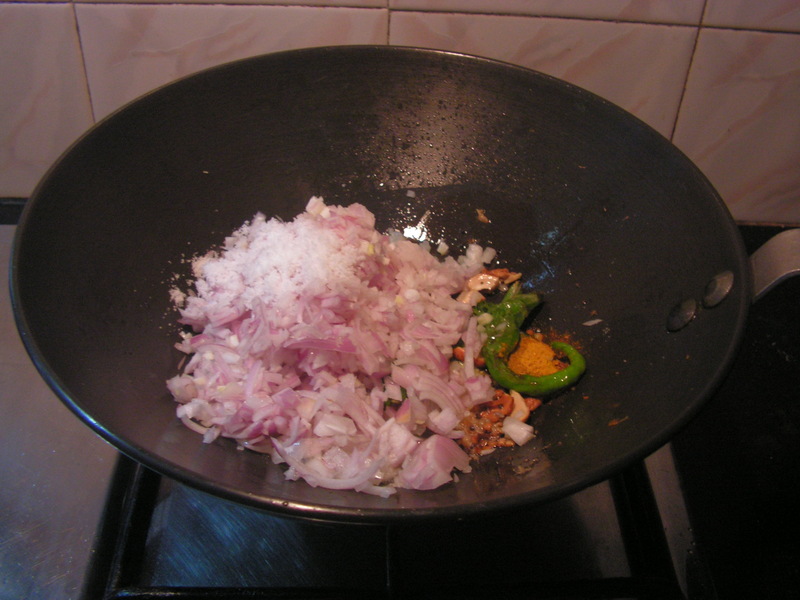 We relished with Onion chutney. 1. 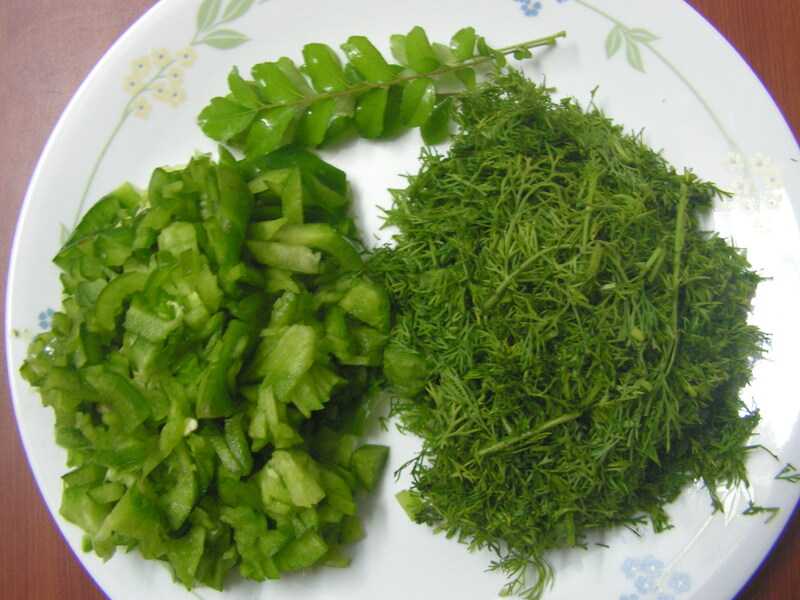 Soaking dals in water till it is smooth is very important. 2. 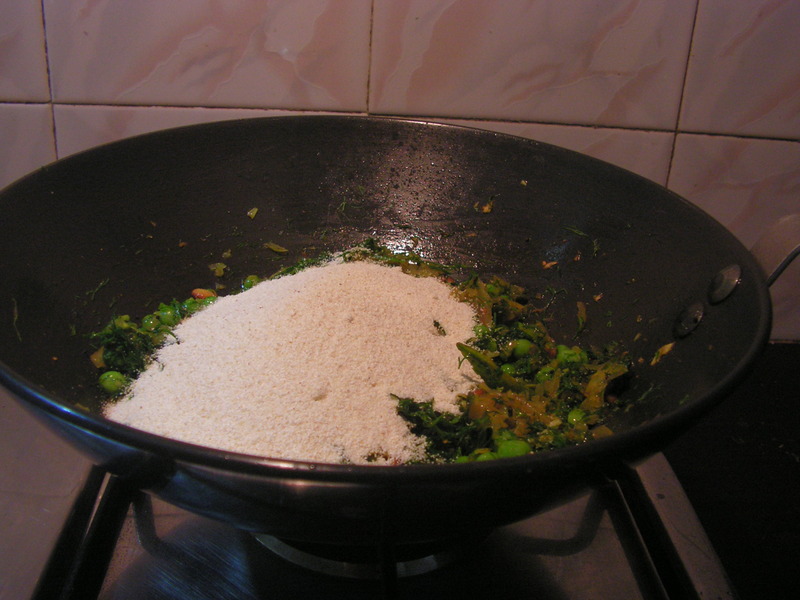 Grinding dal without water will make the dumplings perfect. 3. 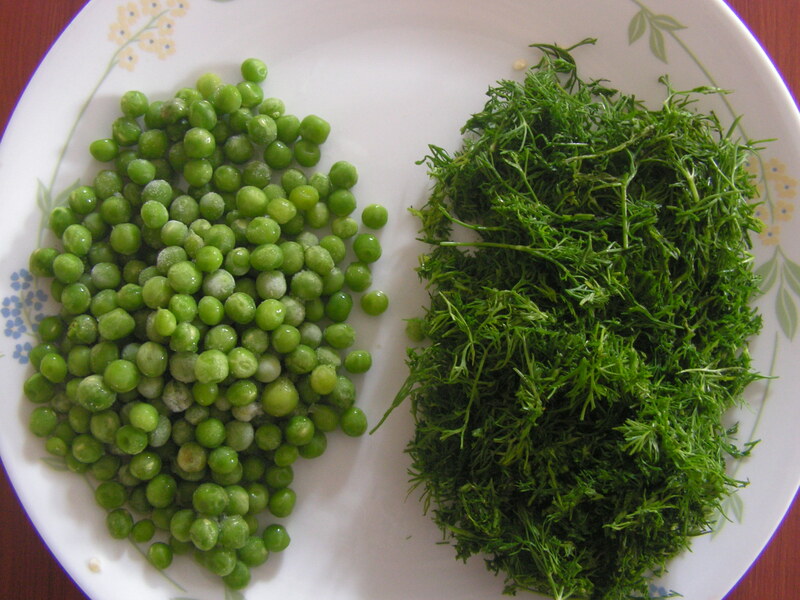 Add any greens of your choice – Mint and Dill are some alternatives. 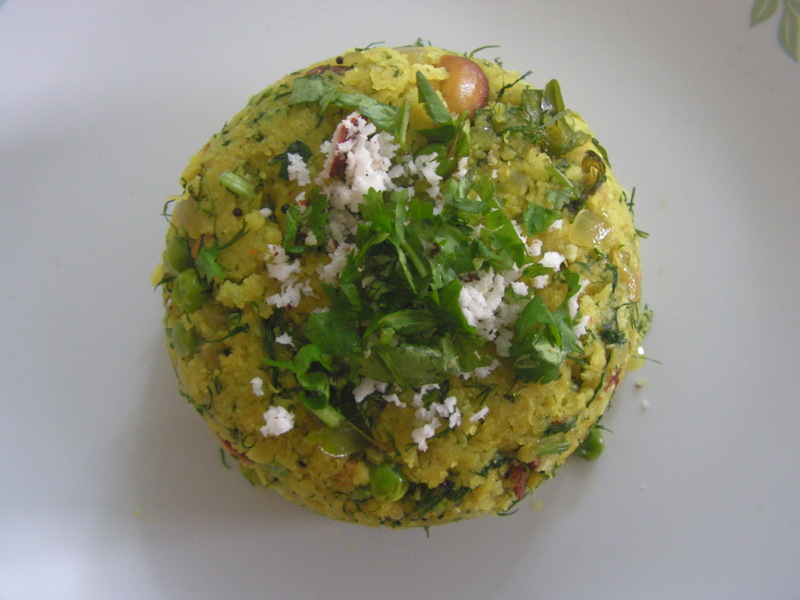 This entry was posted in Uncategorized and tagged Breakfast, Kannadiga recipe, Lunch box.